ANDERSON’s creative approach to client service needs has enabled the company to successfully construct a wide variety of commercial buildings. From small, economical facilities for start-up companies to complex pharmaceutical laboratories, ANDERSON’s proven expertise and trust provides the client with a construction crew equipped with planning, coordination, constructing, and validating even the most technically challenging, complex laboratories and facilities. In 1996, ANDERSON pursued and acquired construction projects in the commercial sector, specifically bio-pharmaceutical cGMP validated clean room facilities. Clean rooms are contamination-free environments where high-tech manufacturing and assembly take place as one of the many projects. The ANDERSON team of experienced construction managers and engineers address all clean room government standards and client design specifications at the pre-construction stage, ensuring that the FDA compliance regulations are met resulting in a timely, cost effective product. ANDERSON’s management and staff’s construction practices are consistently responsive to the highest level demands of the particular client. From high rise to low rise, industrial to commercial, and pharmaceutical to entertainment facilities, ANDERSON gives equal importance to every rigorous detail of every project. ANDERSON Construction, Inc. is a construction company that will work closely with the discerning client, assisting in architectural design needs with specific or unusual requirements. Because of their experience with many diverse projects, they can resolve issues before they become problems. That experience is crucial when design specifications change within the course of the project. ANDERSON Construction, Inc. is comprised of talented, highly competent staff capable of anticipating the needs and changes at every step of the construction process. 14 story, 470 room hotel with four levels below grade parking, two restaurants, and a retail plaza. ANDERSON construction specializes in large tenant improvement projects. Our scope of work ranges from ground up development to interior build-out for office, industrial, and retail users. Projects are successfully completed by applying our well-reputed team approach, coupled with our passion for unique details. We act as a team and our priority is to achieve our client’s goals within their time frame and budget requirements. 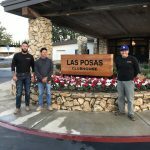 Our staff consists of highly trained construction professionals who understand the changing agendas of real estate owners and users in lease and contract negotiations. Our staff is often able to foresee potential issues within a chain of events before they arise and resolve these issues before they become serious problems. As a general contracting firm, ANDERSON Construction, Inc. has the diversity and experience needed to produce state-of-the-art automotive facilities. 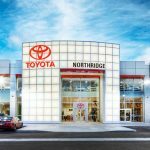 Our project list includes Toyota Car Dealerships in Northridge, California; Mesa and Tucson, Arizona. We pay close attention to the newest developments in showrooms, sales arena, service garages, and parts storage. At ANDERSON Construction, Inc. our success is measured by not only the quality of your completed facility but also by the quality process by which we get there. We understand that the tangibles of the project; dedication to teamwork, focus on client goals, uncompromising quality, and relationships built on trust, are just as important as the building itself.